The Plano Republican told members of the Tea Party-aligned caucus that he was leaving the group because he thinks that his "time, talent and treasure is best devoted to fighting for those things within the Republican Caucus." State Rep. Jeff Leach has resigned from the hardline conservative Texas House Freedom Caucus. The Plano Republican, who was first elected to the Texas House in 2012, sent Freedom Caucus members a message on Friday evening saying he has "decided that I want to recommit myself entirely to the House Republican Caucus — to working diligently with all of our fellow Republicans in the House to ensure that, as a GOP caucus, we stay focused and make great strides on the pressing issues that our voters, including our grassroots, want us to be focused on." Leach added that he hoped his decision to leave the group, which was comprised of 12 members during the 2017 legislative session, "will not, in any way, affect our ability to work together, to meet together, to communicate and strategize together, to vote together, and, importantly, to PRAY together." The Freedom Caucus was formally founded at the beginning of the 2017 legislative session to spearhead a range of far-right conservative issues, such as anti-abortion measures and pro-gun legislation. The group often clashed with retiring Texas House Speaker Joe Straus, a San Antonio Republican, and other House members aligned with the more moderate faction of the GOP. One of the group's more notable footprints was a procedural maneuver known as the "Mother's Day Massacre," which killed more than 100 bills in a single day in May 2017 and underlined tensions between the more centrist Republicans and the caucus. Since the 2017 session ended, though, the group's outlook has seemingly shifted. In last month's midterm election, 11 of the group's 12 members were re-elected to serve another term in the lower chamber. 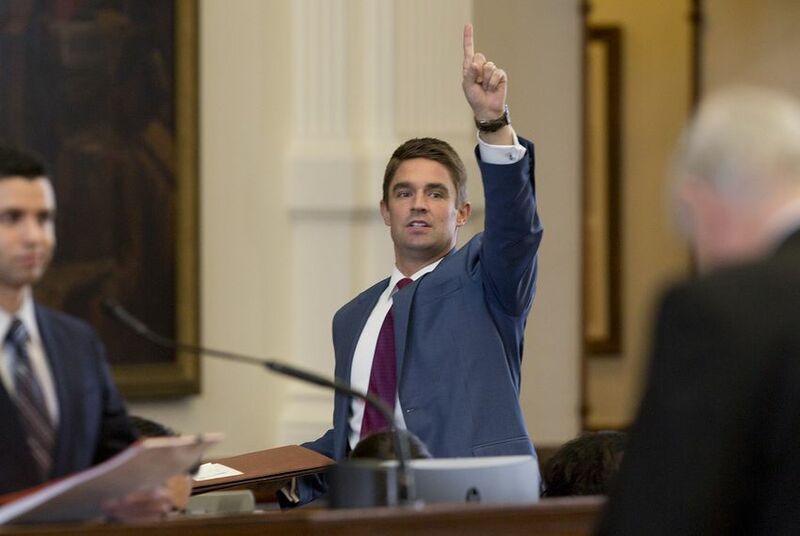 Shortly after that, all but one of those 11 returning members publicly endorsed state Rep. Dennis Bonnen, an Angleton Republican with close ties to Straus, to succeed him as House speaker. That prompted some to suggest that the group could take a less combative approach when the Texas Legislature convenes next month for its biennial session. Leach's decision to leave the caucus happened the night before members of the larger House Republican Caucus, which is set to have 83 members during the legislative session, met in Austin to formally endorse Bonnen as the group's preferred speaker candidate. The vote, which happened in Austin on Saturday afternoon, was unanimous, which signals that all 11 returning members of the Freedom Caucus backed Bonnen for the job. With Leach's departure, the caucus' membership come January 2019 will sit at 10, though there are at least a couple pickups the group could see before then. There appears to be no hard feelings between Leach and caucus leadership, at least publicly. On Sunday night, state Rep. Matt Schaefer, the caucus chairman, told The Texas Tribune that Leach "is as solid as they come." The Tyler Republican also noted in a text message that "unity in the Republican Caucus is a shared goal for all of us." In a statement to the Tribune, Bonnen noted that representatives "join and leave caucuses on a regular basis." "It is my hope that each Member will always strive to do what they believe is right for themselves and their constituents, and I support any decision that helps them fulfill that goal," he said. Here's the full statement that Leach sent to members of the Freedom Caucus.